Going My Way (1944): Dir. Leo McCarey. Written by: Frank Butler and Frank Cavett, from a story by Leo McCarey. Starring: Bing Crosby, Barry Fitzgerald, Frank McHugh, James Brown, and Gene Lockhart. Unrated. Running time: 126 minutes. 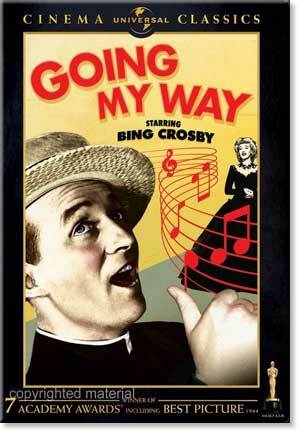 Released in the midst of his popular road pictures with Bob Hope, Going My Way boasted the appeal of popular crooner Bing Crosby. Crosby plays a young priest who has been transferred to St. Dominic’s Church in New York. St. Dom’s is in a sore state, and it’s up to Crosby’s Father O’Malley to save it from foreclosure. Throughout, he tries to remind people that religion need not be drab and depressing, but can actually be bright and fun. Seemingly constructed as a starring vehicle for Crosby first and foremost, the film indulges itself in prolonged musical sequences, doing little to advance character or plot. But that’s okay, because character and plot seem to matter very little to the filmmakers. McCarey’s Duck Soup possessed little of these elements as well, but it had something this film lacks: good jokes. Also unlike Duck Soup, the pacing in this film just drags. Many scenes linger well beyond their desired impression. Couple this with the fact that everything feels so squeaky-clean in this film—from the songs to the characters to the simple plot. When a conflict appears, it is whisked away by the magic of contrivance, robbing the film of any dramatic tension. In one sequence O’Malley persuades the mortgage company to give a break to the Cathedral as well as members of their congregation who are behind on their debt. And what does the company do? It gives them a break, because who needs a business that makes money, right? One ought not to blame the actors for the quality of the film, however. Crosby remains likeable throughout, if impossibly pure and pious, and Fitzgerald as Father Fitzgibbon actually lends some poignancy to the film’s typical mawkishness. If only the filmmakers had aimed for something of consequence with the talent involved.